I get a nice yellow jacket to wear whilst doing the car parking. Once that’s done its ring duty. It’s hot to be working all day on the rings but it’s better than having rain. Competing wise we get eliminated in the pairs, sorry partner, but do better in the individual events. I actually get a clear out of MD. In fact two of them. We come 8th in the Agility, 15th in the Jumping and then nearly go clear in our second Agility of the day but apparently we missed the dog walk contact by half an inch. Can the Judge really make decisions that tight, obviously he can. So MD is doing alright today but Doggo, and it’s so unlike him, lets the side down. He has a pole down in Veterans and they’re only little jumps! Not a bad day though. Back home, L’s parting shot as she gets the bus over to join me, is to tell Son that his beard looks cute, knowing full well it would be gone shortly afterwards. Good tactics. I head over to Burton to meet L and to get some take out beer. 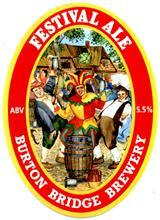 Burton Bridge’s 5.5% Festival Ale is a good choice for our takeout tub but one we’ll probably regret. 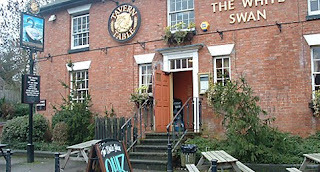 Before we get our teeth into that, we eat at the local pub, the White Swan in Walton on Trent. The service is slow, only one chef on apparently, but their special Lamb Dopiaza was very good.